Andy Osnard: Come on Harry, where's your patriotism? Harry Pendel: I had it out in prison without anaesthetic. Those expecting a flashy spy film with numerous chase sequences (only one), large body counts (only one), and state of the art gadgets (again, only one) are bound to be disappointed in John Boorman's The Tailor Of Panama. With a plot based on the best-selling spy novel by John Le Carre and starring Pierce Brosnan in the role of a British spy in an exotic location, The Tailor Of Panama isn't as much a spy story as it is a tightly woven character study. Andy Osnard (Brosnan) is an MI6 spy with little future in the organization after several scandalous affairs. As a sort of punishment he is sent to Panama to work out his time and stay out of trouble. As he arrives he becomes intent on breaking a story that will have MI6 begging for him to become a top agent once again. His main informant will be a local tailor named Harry Pendel (Rush) with a secretive past known by Osnard. Harry is an easygoing businessman in Panama with a beautiful wife (Curtis) and two small children. Everything in Harry's life seems to be going well except for a large amount of money owed to the bank, which Harry has no clue how to repay. Soon, Andy's offer of cash in return for secrets on the ownership of the canal seems appealing and Harry begins to tell everything to Andy. As the deal works well for Harry, it doesn't for Andy who relays the information given by Harry to his superiors not knowing that Harry has in fact been offering up large amounts of fiction. Owing more to the Graham Greene spy novel spoof Our Man In Havana than to other spy films, The Tailor of Panama is a stylish though often cluttered movie that while engrossing never grabs hold of the viewer to completely involve them in the plot. As several scenes shift from farce to seriousness with no transition the script at times seems like the wrong fit for the picture. The Tailor of Panama is a wonderfully sly and complex picture, yet at other moments it feels rushed and uneven. The saving grace is that no matter the tone of the scene the picture still works well. It is in the direction and performances that The Tailor Of Panama undoubtedly excels. Boorman, whose projects lately have been hit and miss, injects The Tailor of Panama with a sense of style that is unrivaled in recent releases. Though Boorman starts the picture slowly, the film gains momentum, as the final act becomes a breathless double cross where it is unclear just who can be trusted. An added touch is that Boorman chose to shoot the Tailor of Panama on location, giving the movie a wonderful atmosphere thanks to Philippe Rousselot's gorgeous widescreen cinematography. Along with the sun rising and setting each day it has become a given that any performance by Geoffrey Rush will no doubt amaze audiences. Here Rush plays a simple businessman that gets caught up in something bigger than he can imagine and must try to fight his way out of the web he has spun. It is an extraordinary performance by Rush in the way that he seems so confident while spouting false information to Andy, and then in the next moment scared as to how he will survive this mess. Pierce Brosnan, whose side gigs as 007 will no doubt draw comparisons to his character here, in fact plays the anti-Bond. As a womanizing, hard drinking battered soul who looks to be seeking redemption even though he is not sure from where, Brosnan brings a cocky edge to his performance. Supporting roles by Jamie Lee Curtis and an unrecognizable Brendan Gleeson are done well, especially Gleeson who is nearly unrecognizable underneath a beard and a Latin accent. Image Transfer Review: Since I bought my first DVD player nearly four years ago, I have grown accustom to the gorgeous transfers that Columbia Tri Star have bestowed on their DVD releases. 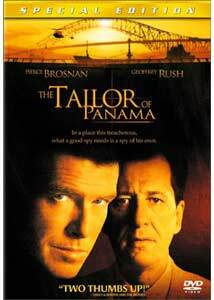 With The Tailor Of Panama the studio has produced one of their more disappointing efforts. Presented in its original 2.35:1 widescreen aspect ratio and with anamorphic enhancement The Tailor Of Panama looks fine, yet could be a lot better. The largest problem is a severe amount of edge enhancement throughout the length of the picture. Detail and sharpness are very well represented though the film has a soft look at times. Colors are vibrant at times and black levels come off nicely with a lot of detail. Pixelation is evident at times though never often enough to be noticeably distracting. Audio Transfer Review: Presented with a Dolby Digital 5.1 mix The Tailor Of Panama comes off sounding great even if it isn't very active. Shaun Davey's score is the star of the mix as it envelops the room in clear and crisp recreation. Dialogue is easy to understand throughout with no harshness or distortion. The only complaint that can be said of the mix is that the track seems to have been mixed at a low volume causing the volume on my receiver to be near reference level. English and French Dolby 2-channel mixes are also provided. Extras Review: Heralded as a special edition The Tailor Of Panama isn't quite as deserving of that mark as one might think. A feature length commentary by director John Boorman leads things off and is mostly enjoyable. Boorman talks largely about the production and shooting on location, as well as the original John Le Carre novel upon which the film was based. The most interesting moments come when Boorman talks about the cast and the inevitable comparisons of Brosnan's role in this film to his James Bond pictures. An alternate ending is presented that while different from the finished material, I feel is infinitely better. This clip can be viewed with or without commentary by director John Boorman. Also provided are filmographies, production notes, the trailer for The Tailor Of Panama as well as Les Miserable. A 25-minute interview with stars Geoffrey Rush and Pierce Brosnan round out the extra features for The Tailor Of Panama. The two offer their thoughts on the novel, Boorman, and their performances. Rush is the more outspoken of the two and makes this more worthwhile with his thoughts on the film. The Tailor Of Panama is a stylish and beautifully acted movie that shows beyond a doubt that the craftsmanship of a talented director and actors can often make all the difference. The DVD by Columbia Tri Star is a bit below their normal level of quality, yet the effort is nice. Recommended as a rental only.